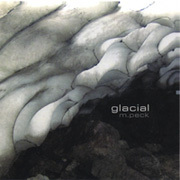 On Glacial (48'14"), M Peck strikes an interesting balance between free-form impressionism and sonic narrative. His frigid constructs are understated yet compelling. Over the course of the eight tracks, Peck offers plenty of ice and frost, but also air and light. Bitter tones creak and scrape where the mood is more withdrawn while entangled harmonic clouds sustain and shift through lighter regions. Crystaline patterns of synthesizer blips careening across a glistening polar icecap slow against the stillness of hibernating drones and dripping icicles of sound. In a world of two dimensional realities, Peck's music is nuanced and lifelike. He does a great job of portraying cold conditions, based on both the literal arctic regions of the planet and the isolation of reluctant solitude.